The wrecker got an interesting start. The tow truck was invented in 1916 by a garage worker named Ernest Holmes from Chattanooga, Tennessee. Holmes had the idea after one of his buddies flipped a Model T over in a ditch. It took blocks, ropes, chains, and six men to free the car. Ernest knew there had to be a better way! His first prototype involved attaching an iron chain, a pulley, and several poles to the back of a 1913 Cadillac. Can you imagine? 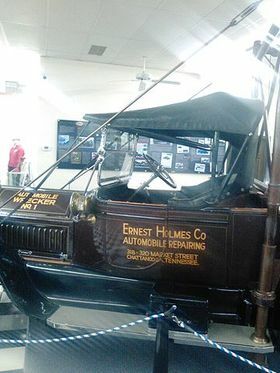 Holmes spent the next two years perfecting the model and applied for the first patent on January 17, 1918, giving birth to the towing industry. His invention quickly became the standard for rescuing and transporting inoperable vehicles and played a major role in World War II when Holmes Co. outfitted the allied forces with almost 7,000 military tier wreckers. ​Ernest Holmes Company lives on today through Miller Industries, which is a leader in towing and recovery equipement. Since they were founded in 1990, they have been providing high quality equipment around the globe. They have manufacturing facilities in the US, England and France. In addition to Holmes, they also market their products under some other well-known brands like Century, Vulcan, Chevron, Boniface and Jige. Their line of equipment ranges from snatchers all the way up to carriers up to thirty feet long that can handle 40,000 pounds and towing recovery units with boom capacities of 75 tons. Their website had a huge variety of images and videos and towing enthusiasts should check it out! The International Towing and Recovery Hall of Fame & Museum, located in Chattanooga is dedicated to preserving the history of the tow truck home to an extensive collection of vehicles, including a replica of Holmes' original wrecker. ​The next time you see a tow truck, please slow down and move over. The towing profession is one of the most dangerous in our country. More than one tow truck operator is killed every week assisting motorists on the road. The men and women who come to our rescue are putting their lives on the line with each call. In 2005, a Survivor Fund was established to provide immediate financial support to the families facing the unthinkable. Generous support from industry associations, along with contributions from corporations and individuals, have made it possible to provide quick and significant aid in a time of crisis. The Survivor Fund is committed to making the public aware of the significant danger of the towing profession and building this fund to support families in their greatest time of need. You can learn more here.